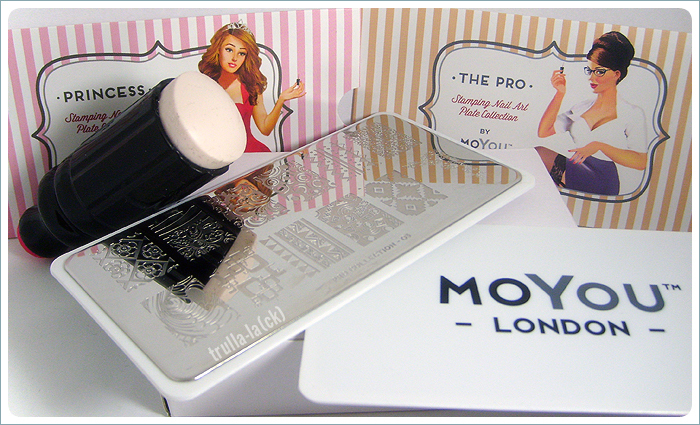 As mentioned in my last post, I recently fell in love with the fantastic stamping system from MoYou London. I always liked stamping, but with my very curved (in both directions 😦 ) and therefore also very wide nails, I didn’t always get the results I wanted. Gaps on the sides or at the tip were among the usual problems I had, on the side because the patterns were too small, on the tips because of the curve. I always thought about investing in XL plates and stamper, but never cold bring myself to order them. But then I read the review from Jen (“The Nail Polish Project”) about the XL Stamper (so amazing, look at those pictures! ♥ ) AND saw MoYou London also had XL plates, and knew I had to give this a shot. So far, I am not disappointed. The plates are just fantastic, such great patterns, nicely etched and work as a charm. I tried a different polish for stamping on every finger, just to see how the different types work. I had the feeling that the etching is deeper than with regular plates (which would mean the layer of polish you stamp on your nail is thicker, so the polish you use doesn’t have to be that highly pigmented), which is why I included a test with the KIKO polish I used as base color on the other nails. This is a true two-coater, meaning that it is only fully opaque on the nail after a second coat, and as you can see, it worked surprisingly well. – To get the pattern from the plate to the stamper, the instruction page suggests “using a rolling motion”. That doesn’t work too well for me (see index finger). What worked even less was using as much pressure as I did with my regular Konad stamper. When I first tried and did it as I was used to, I almost went mad because I was not able to transfer the pattern to the stamper for the life of me. I accidentally found out that light and easy (and simply straight down) does the trick for me. 🙂 So if you have trouble, you might try using less pressure. – The stamper is sticky, so you probably always have some dust or lint on it. It drove me crazy at the start, but I learned not to worry too much about it, as it somehow won’t transfer to the nail. Just get rid of the worst by rubbing the stamper over some damp kitchen paper (I use a piece of kitchen paper soaked with polish-remover to wipe the stamper between nails anyways) and you should be fine. – I am not using the regular way of rolling the stamper across my finger, but simply press my finger into it. I tried to get a picture of that, but with holding the camera and holding the stamper, I had no finger left. 😉 Jen did another review, where you can see a picture of how I do it, too (you have to scroll down a little). 01. Dec. 2013 in Review, Stamping.